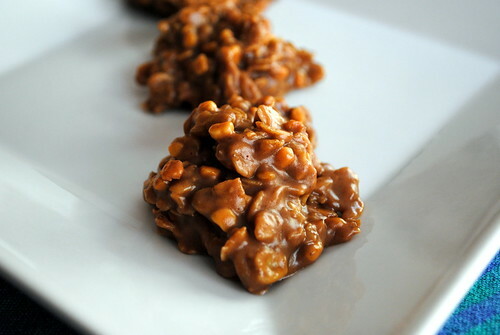 No-Bake Peanut Butter, Chocolate, Oatmeal Cookies! Posted on February 25, 2012 by Clare Cooks! Does anybody remember the great peanut butter price rising scare of 2011? Well, when I heard about the cataclysmic events that were going to be caused by peanut butter prices skyrocketing, I did what any sane person would do; Ran to Costco and bought the biggest jar of peanut butter I could find and since this is Costco, it obviously came in a 2-pack. Fast forward to this week and as I was looking for a large can of tomatoes in the bottom of my kitchen pantry, I stumbled upon, not one, but two unopened Costco-sized jars of peanut butter. Fortunately, processed peanut butter could survive the apocalypse, so it was still good. It was upon seeing these two jars that I realized that my visions of becoming rich via the illicit peanut butter black market I had hoped would emerge as a result of worldwide peanut butter prices rising, that I should probably set about actually using some of the peanut butter I have been hoarding. Enter these cookies! These are the easiest cookies in the world to make! There’s no baking, there’s peanut butter, there’s chocolate, there’s oatmeal, what’s not to love? I cut the original recipes suggested sugar in half and they were still plenty sweet. I think 2 cups would be way too much. My only word of advice is to use the fridge or freezer to help them set. Maybe it was because it was unseasonably hot the day I made these (around 80F/26C, in February… Gross. ), but they would not harden. I stuck the cookie sheet in the fridge for about 30 minutes and they were perfect. In a heavy saucepan bring to a boil, the sugar, cocoa, butter and milk. Let boil for 1 minute then add peanut butter, vanilla and oatmeal. On a sheet of waxed paper on a cookie sheet, drop mixture by the teaspoonfuls, until cooled and hardened. Throw the cookie sheet in the fridge to help speed up the process.